JD is a promise. Above all, the JD-XA is a promise. You don’t have to think in terms of Oberheim’s classic OB-Xa to suspect that Roland’s JD-XA has a lot of muscles and energy behind it. Whether this is unconditionally true or not – we’ll see! 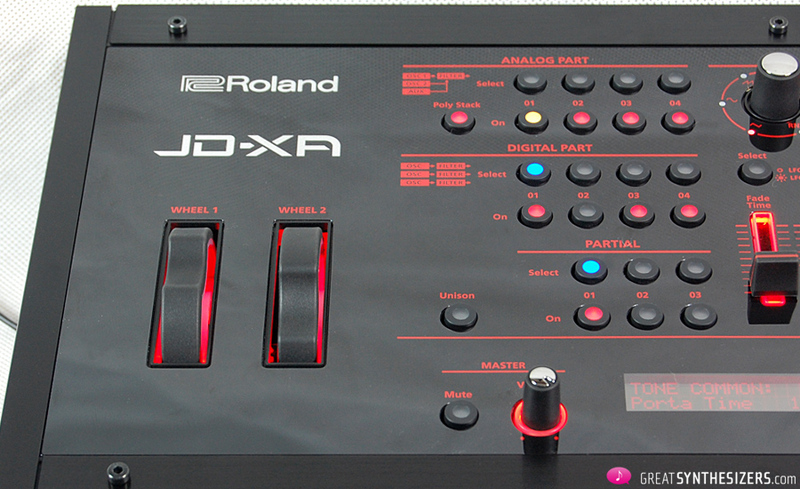 In the shadow of the famous JD-800 synthesizer (and JD-990 synth rack module), JD-XA represents an interesting conglomeration of different Roland instruments. And it may be, if only unintentionally and not in the common sense, a milestone in Roland’s synthesizer history. JD-XA hardware has many interesting features. Lets’ begin with the positive. 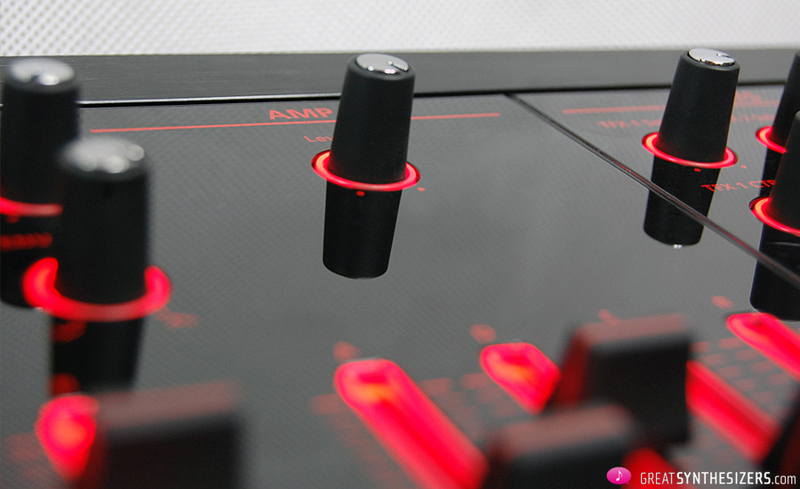 The knobs and faders are good (to exceptionally good) quality. Especially in comparison to the JD-Xi we find the potis here worlds better. Nothing wiggles. And the red-illuminated anthrazite knobs with their silver caps are class, pure class. Update 01/2016: Synthgraphics.com now offers extra – much nicer! 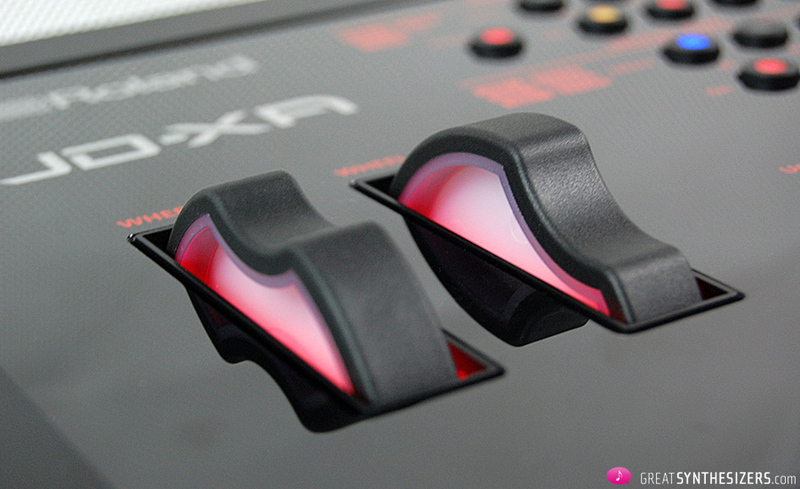 – JD-XA panel overlays with a matte surface. Which means: one or two days after going into operation, JD-XA looks as if it has been in the studio for months, if not years. (Hint: the shiny appearance of the JD-XA is best photographed on the first day, for obvious reasons mentioned above). And there are other little surprises. You can’t fool an old (experienced) keyboarder: this keyboard is slightly different. All of those keys have been shortened by 1 centimeter, something you’re painfully aware of as soon as you play it. 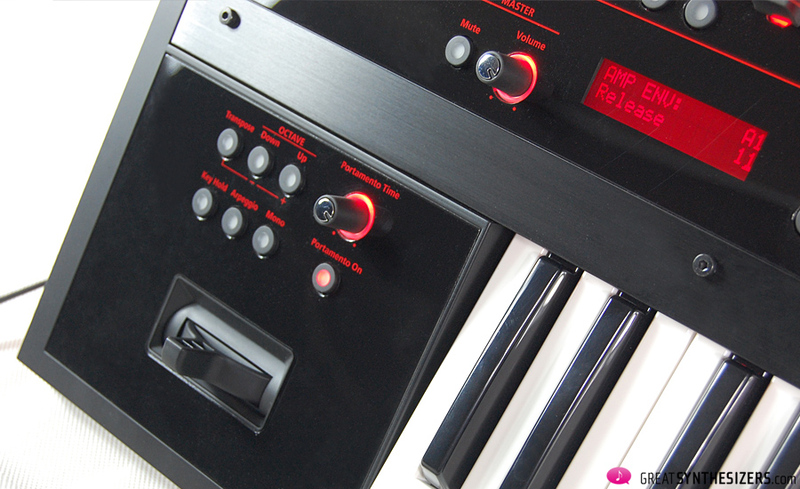 Our test instruments were the Yamaha CP-70B grand piano, the JD-800 synthesizer and … the JD-XA! … which doesn’t say much at all. One centimeter (or two, compared with an acoustic piano) – is that such a big deal? Bigger than you think! The player’s fingers are constantly touching the instrument’s casing when playing the black keys – really irritating. Too short, simply too short. In addition, velocity sensitivity is imbalanced. We established this on the basis of the well-known JD piano-sample (those lanky piano sounds that wrote pop-history). On the one hand the JD-800, on the other the JD-XA. The JD-800 keyboard allows for relatively precise musical expression, which isn’t necessarily true with the JD-XA. If touched too lightly, the sound just disappears. If played too hard, it remains at a medium volume level, or pops up in unexpeted accents. Listen to the attached soundfile “FantaPiano” where unintentual accenting is a give-away for imbalanced keyboard velocity. Also – and we end our keyboard-thoughts at this point – a 4-octave keyboard range is just too small for a grown-up synthesizer (considering all the inner potential of the JD-XA). Performing those huge Roland padsounds requires an external masterkeyboard, which can’t be what this is all about. 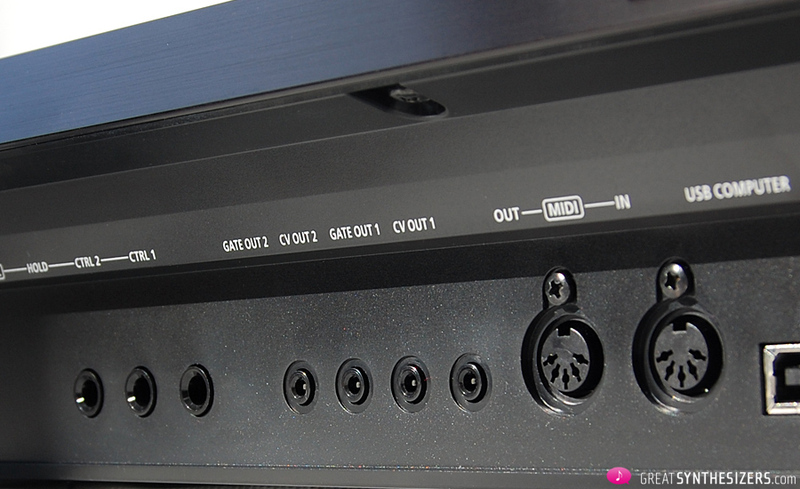 Tucked away in an internal hollow space at the back, the in/outputs simply cannot be detected easily. 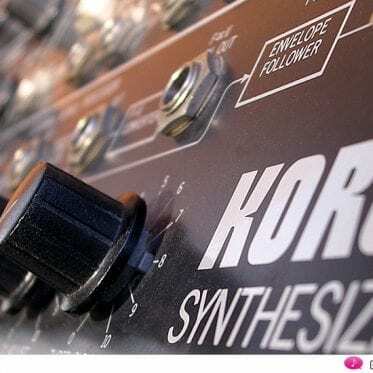 Gone are the days when manufacturers put that lettering on the upper surface of the synthesizer, so that it was even possible to change connections from the front. Now let’s talk about the weight of the JD-XA, which says something about its probable over-all quality. Its really (really) easy to pick up this synthesizer in its keyboard rack (just crane your neck a little and stick in those cables), since the JD-XA weighs next to nothing. A modest 6,5 kg (without power supply)! The power supply is – you guessed it – external. Congratulations to those of you who can handle tiny electrical connections. In our opinion, a 2000+ Euros keyboard (a pro-instrument, so to speak), should boast an internal PSU with a standard power cable. Last but not least, let’s look at the user’s manual. Instructions in 8 languages, black-and-white pictures of poor quality and on thin paper, neither well layed-out nor informative (endless rows of lists and tables). It’s a crying shame! Not informative? An example: the explanation “[Unison] button: Selects unison. 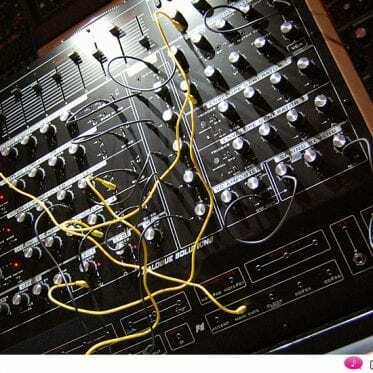 […]” (see graphic) is an insult to the intelligence of an experienced synth user. And it’s absolutely no help to the novice, since there’s no explanation as to what “unison” means (which definitely was the question behind the question in the first place). 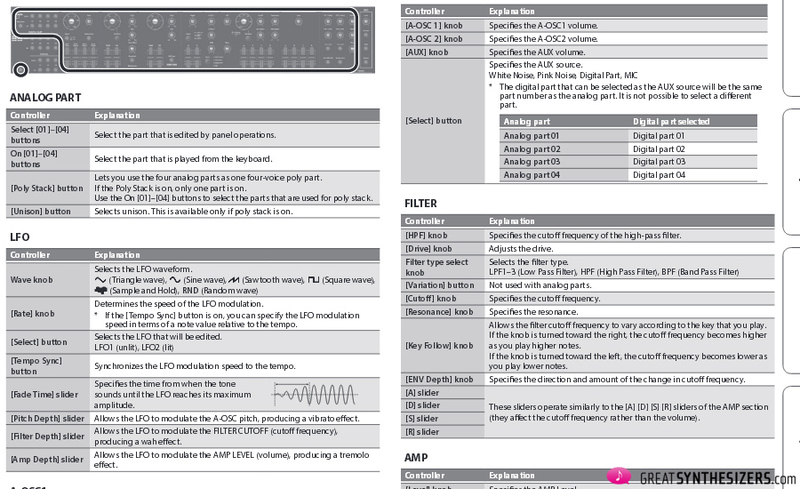 The “Parameter Guide” (again endless rows of lists and tables) has been relegated to online (PDF), as have the “MIDI Implementation Charts”. Having gotten all that stuff about hardware deficiencies and poor user service off our chest, back to the sunny side of things. 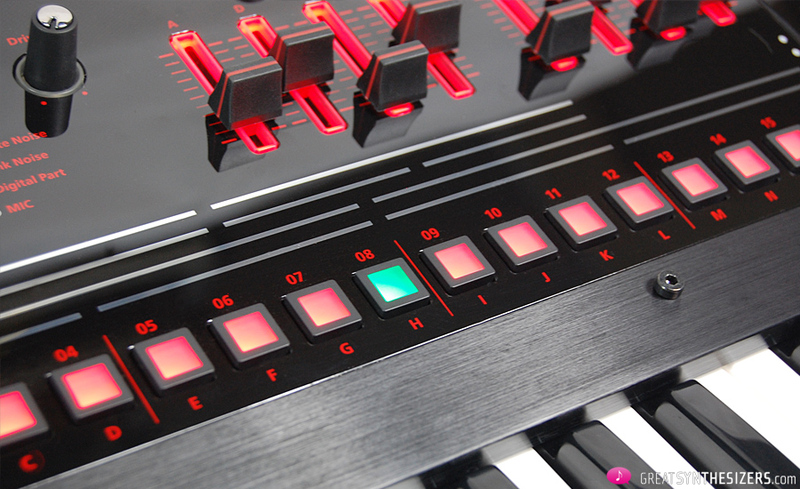 The JD-XA has enormous creative potential (in the good Roland tradition, based on technical know-how) … and YES – the synth sounds good! 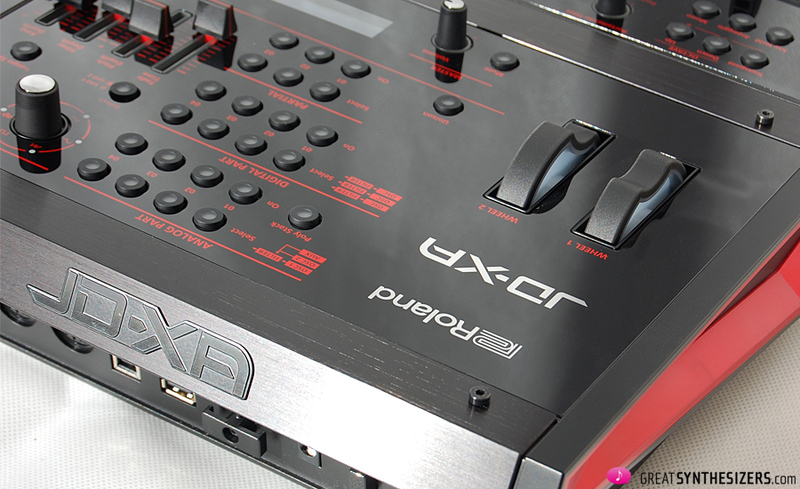 JD–XA is a “Crossover Synthesizer” (hence the X in the name), a mixture of ANALOG and DIGITAL. To put it more clearly: the JD-XA is a mixture of JD–800 (patron and supplier of certain samples), JP–8000 (4-octave keyboard, step / phrase sequencer), Integra (sound engine – SuperNATURAL sound generation) and a new analog part, a complete innovation. Sound of the future? A noble idea, and very inspiring indeed! Again, in REALTIME mode the controller movements are recorded with the assigned sequence, which of course is awesome! The assigned sequences in turn are also saved as part of the program. This is excellent! And, programming patterns in STEP mode is real fun! Adjust the desired pattern length, press REC(ord) and off you go! Many of the attached sound files have been created super fast, thanks to the JD-XA step sequencer. BUT speaking of sound examples: listening to them carefully you might realize that the patterns hardly move up and down. There’s only a little transposing, leaving a somewhat boring musical impression the first few minutes … This is because transposition of the pattern sequencer via the keyboard is NOT possible. Shame on Roland (they made the same mistake with their superb JP-8000 step/phrase sequencer way back in the 1990s). Ok, pattern transposition in realtime is not possible. What about independent pattern lengths? Ah, there’s the knob, let’s see … you can choose between 16, 32, 48 and 64 steps. Nothing in between. No creative possibilities here, no chance to do some minimal stuff in realtime (performing patterns of completely different and assymetric lengths, let’s say 13 – 31 – 52 and 63 steps in a constantly changing loop). However, there are some creative features in the sequencer section. Steps can be muted in realtime (allowing for rhythmic variations), quantizing is possible (on/off), then there’s a shuffle function, and SMF (standard MIDI files) can be loaded into the JD-XA sequencer. 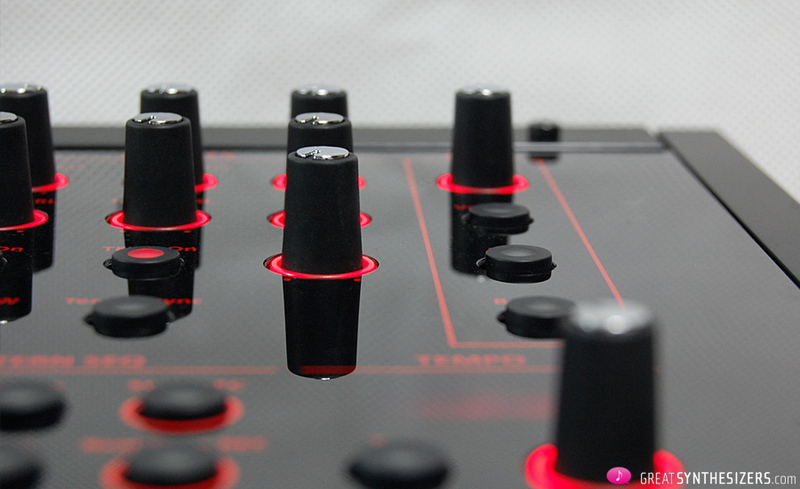 The arpeggiator offers 64 templates/patterns. When creating your own pattern its possible to program note numbers (number of steps being played) and velocity values. The JD-XA offers the classic Roland pitch/mod bender PLUS an additional pair of wheels (again: pitch and modulation). This is superb! Modulations (vibrati) can ne set to permanent effect, which is far better than having to push the pitch/mod bender throughout your playing! 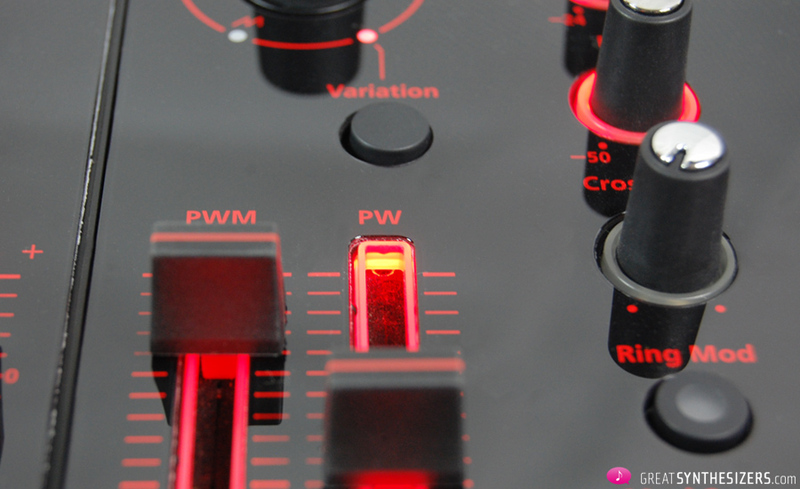 Both wheels (wheel 1 / wheel 2) are programmable, which is again a smart move towards in-depth sound performance. 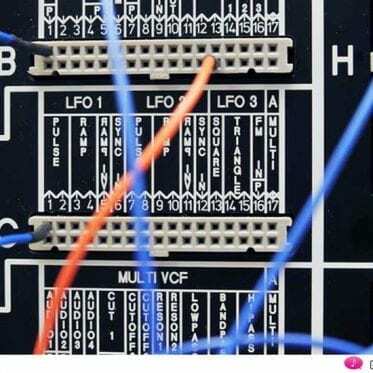 Keyword “LFO”: there are two LFOs in the synth section and another one in the pitch/mod wheel section. The latter is called MODULATION LFO, mostly used for vibrato effects. And, believe it or not, this LFO has a secret. I did this once. It worked (and I set MODULATION LFO speed to 50, which comes a lot closer to a “natural sounding” vibrato). The next day I tried again. And it did not work. Why? Well, the manual reveals that any changes concering the MODULATION LFO can only be done by activating the synth’s LFO section first. 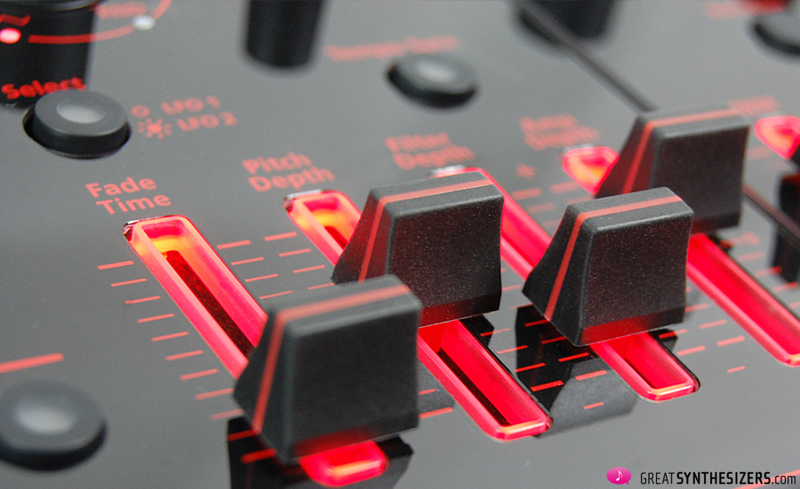 Turn, for example, the LFO Rate knob, so the JD-XA knows you wanna change LFO settings, then hold down the [Shift] button and move the pitch bend / modulation lever away from yourself: now you have access to the MODULATION LFO. In a nutshell: the JD-XA sounds very good. Surprisingly enough, it’s the DIGITAL part that blows you away. The ANALOG part is nice, but not all that exciting. Again in a nutshell: those JD-XA samples are fantastic – strings and choirs of this quality are seldom heard. The SuperNATURAL sound, so to speak. 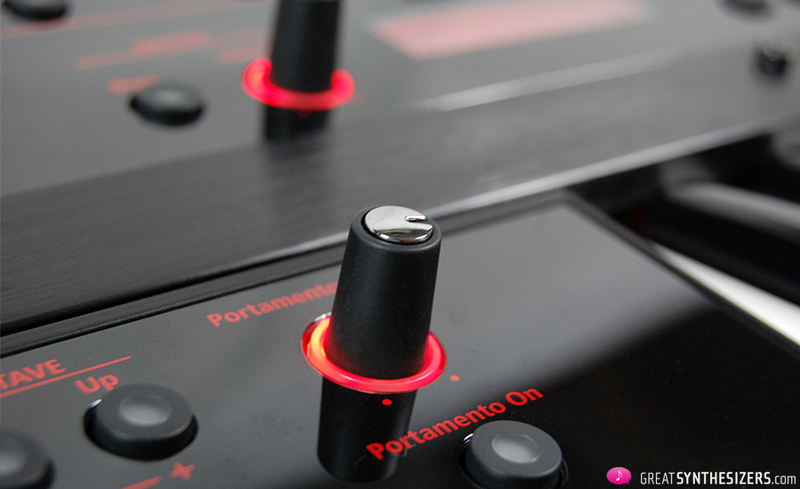 You could buy an additional Roland Integra just for the purpose of playing good samples (if that’s all you want), but the JD-XA has the singular advantage of direct access to the sound components. 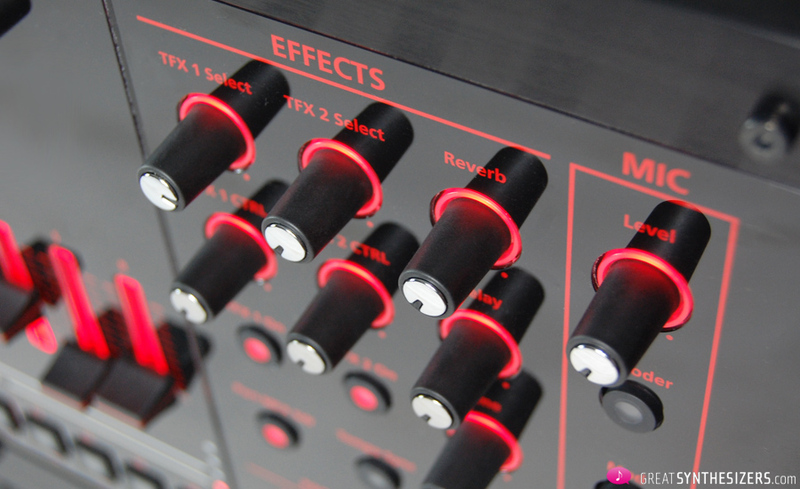 Open/close the filter, change attack time, reduce decay, program a 32-step bassline, add two ANALOG and another DIGITAL sound part, change the effects … THIS is the creative JD-XA! It’s fun, and the sounds are definitely impressive! The effects are of standard quality, not really over-the-top, but alright. The analog sound engine has its own (!) 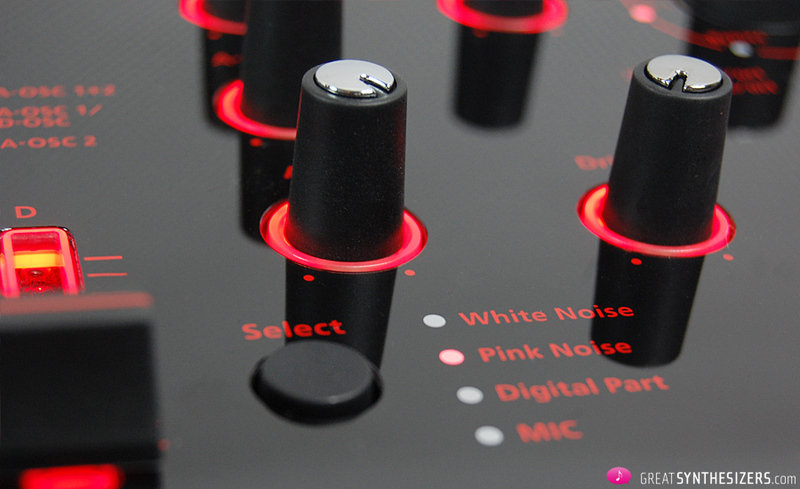 output, which is quite superb since you can send the DIGITAL and ANALOG audio signals separately to the mixer (or to additional, external sound processing units). 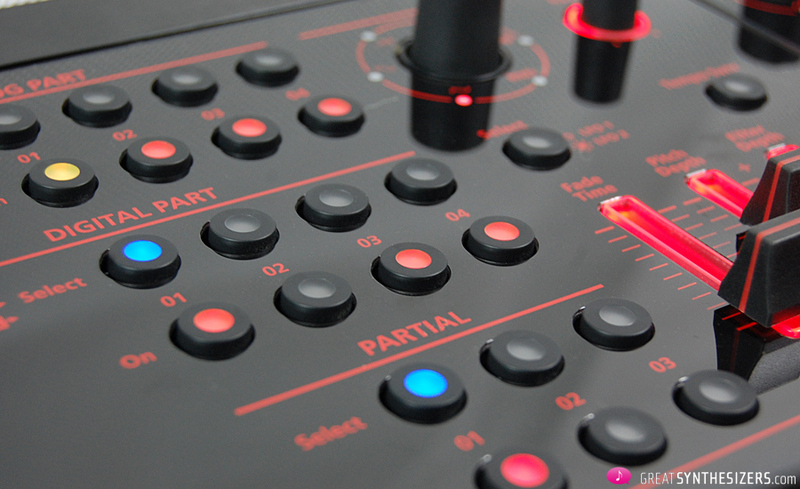 Last but not least, the JD–XA includes a vocoder! And drum loops can be programmed similar to a TR-808 (the corresponding scale label dates back to 1983), again expanding the instrument’s sound potential. First, some sounds come with a little noise in the audio path. Listen to the attached files – you might pick up that noise in some of the recordings (try “Pad 2”, for example). While part of the noise comes from the JD-XA audio section, the internal effects contribute some noise as well. Second, the instrument’s ANALOG sound part is a bit of a disappointment. 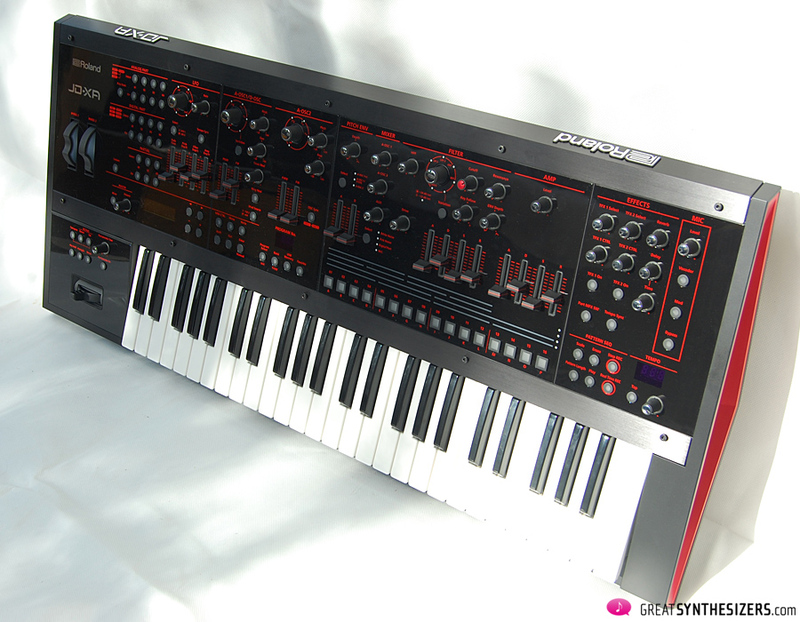 Good old virtual-analog JP–8000 sounded better (in our personal opinion)! Somehow the JD-XA’s analog filter is not as effective as we had expected. The various filter modes (LP 1 / 2 / 3) all sound quite the same (even HP / BP), and filter resonance is overly aggressive*. 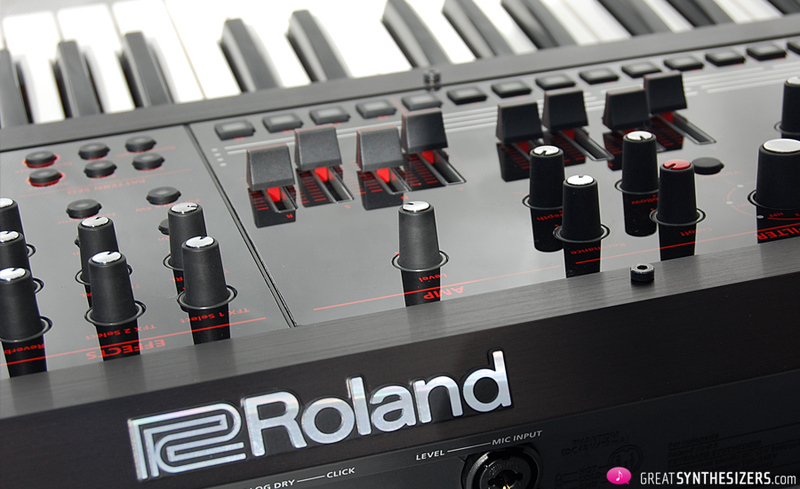 The Roland JD-XA Crossover-Synthesizer supplies you with inspiring high-quality sounds, resulting for the most part from the SuperNATURAL Synthese in the DIGITAL part of the instrument. And direct access to all those elements of sound gives you a superior musical synthesizer with far-reaching perfomance possibilities. Analog patterns, vital drum-loops, live-generated vocoder sessions, crazy sync-sounds and soft pad sounds qualify the JD-XA as an extremely versatile instrument. On the other hand, we can’t ignore detractive sound elements (noise in the audio path, at least with our test model), problems with some aspect of the hardware (too short 4-octave keyboard, shortened keys, imbalanced keyboard velocity, external PSU), a purely thought-out and insufficient user’s manual, and disadvantages in performance (step sequencer without transpose-function, etc) and synth programming. So, all in all, the JD-XA is a great synthesizer in a musical sense (thanks especially to those unbelievably high-quality samples) with some not-to-be-ignored weaknesses (that inadvertently result in a weakened final performance). We have attached 35 minutes of audio-files. Everything JD-XA, no exceptions, except soundfile “SyncSound” (boasting an additional GRP A8 stereo sequence). Thanks for your thorough review! You mentioned “a little noise in the audio path.” During testing, did you ever hear audio pops or crackles from any of the patches featuring digital sounds? My JD-XA occasionally produces audio pops and I’m trying to determine the cause. I bought a JD XA 2 weeks ago and also hear these occasional cracks… Any help? ideas? Thanks for the review! The synth sounds very promising. 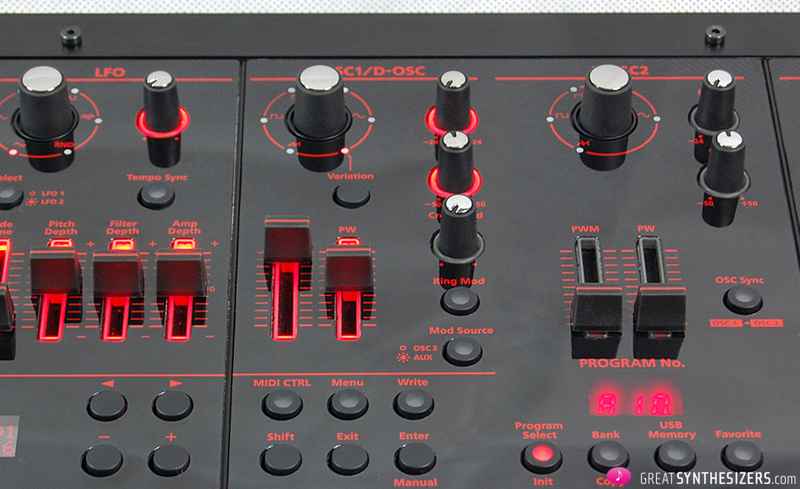 But it is a shame that Roland took the very basic sequencer of the JD-Xi — that’s a real flaw! For perfomring you need an extra little box now. Theo Bloderer: this is a good and thorough review, and I agree with most of the complaints! 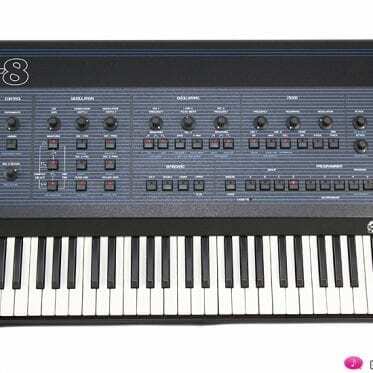 And I also found this synth as “what JD-800 could have been in the right hands”. I like it that Roland is forcing us to create sounds this time around! But velocity issue with pianos are ALWAYS just the patch – synths are normally no match for sometimes cheaper digital pianos in this department! I’ve set my velocity curve to Light and this helps with the disappearing notes. It will not help with “JD Piano” which is just as bad on the JD-Xi, but on JD-Xa you can layer it to make it nicer! sounds… Did you program them or are they factory patches? How can I get some really good JD-800 sounds for my JD-990 from you? These demos are the final straw that broke my camels bank. Especially the one entitled sequence 2. That track should be on an album. I have been flipping back and forth, System 1 combined with Sub37 or just the one JD. This demo sold me. The review was damn good too. Looks like I’m laying down my money. Damnit. Gear lust is as close to mental illness as it gets . … I am very sorry to hear that. Thanks for sharing the info! I found the answer on page 7,396 of the SYSTEM menu. Simply turn on “Remote Keyboard.” The JD-XA will see incoming MIDI as though it were the local keyboard being played. An elegant solution which I simply had to dig a little to fond. To their credit, Roland sent me an email shortly after I had found the solution for myself, telling me where to look for it. Glad you found a solution… another thought is that each part is assigned its own MIDI channel. I like that because I use an external sequencer to play 3-4 different components, and then if I want to parts to be played together as one pattern I just make sure to assign them to the same MIDI channel. Made same mistake. Started setting all Parts to MIDI channel 1, which also works, UNTIL you start multi part MIDI sequences. 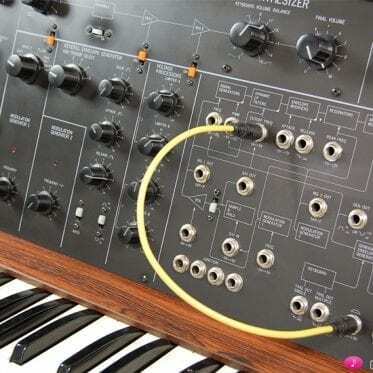 There’s an awful lot to learn on this synthesis, though agree analogue filters are bland. Major Bug-1: If you set Local Switch = Off, and Remote Kbd = On (to try to play all the active Parts from a single MIDI channel), the bug in the system version 1.10 will make the JD-XA to shut down, and no sound will be produced. Roland USA has suggested that I set all the active Channels to a single MIDI channel; however, this will simply bring out another serious bug as follows. Major Bug -2: If you set more than 2 Parts to the same MIDI channel (because Remote Kbd does not work properly as I mentioned above), the JD-XA starts to produce a type of sound that is normally associated with MIDI feedback: Thin and distorted. This is particularly noticeable when you assign two strings Parts to a single MIDI channel. If your ears are not quite used to detect MIDI feedback, it might take a little while to notice it, but it’s unmistakably there. Major Bug -3: At the Program Level, there are “Ctrl Src 1-4” that are designed to be set to CC01-95, Bend, and Atertouch; which should be used by setting System Control Source to Program. But believe it or not, the destinations for these control sources are entirely missing, so even though you can specify the source of these controllers, you cannot assign what they should do. Of course, since the Analog Parts have Matrix Controls (Oddly the Digital Parts do not), we really don’t need these extra controls, but Roland should just take them out from the menu if they are not going to odd the destinations. So have I decided to return the JD-XA? Not at all, because in spite of these problems, I find its sound to be extremely beautiful: You are wrong to think that its oscillators and/or filters are not very interesting, and here is part of the reviews by SOS: “… The signs continued to be positive as I explored the filters. Each can be dirtied up in its own way using the Drive control and, to carve out the excess slush, a (non–resonant) high–pass filter is always on tap. 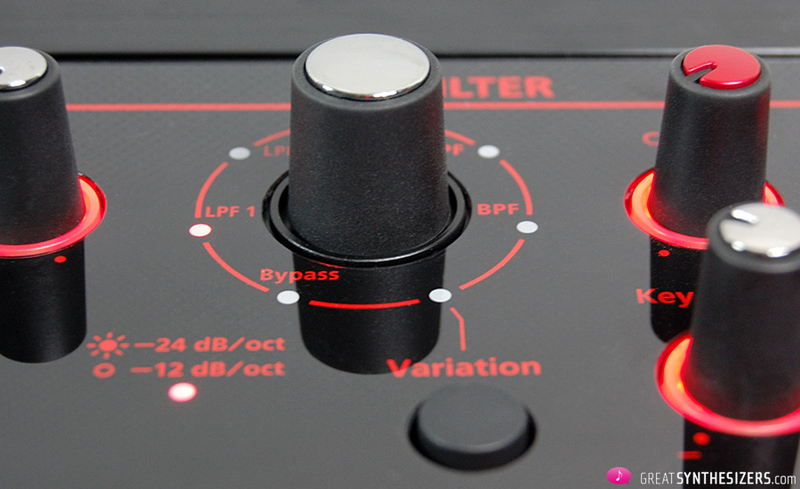 The main filter selector offers three very different choices comprising two low–pass designs and a unique multi-mode filter, the latter demonstrating that Roland haven’t run out of analogue surprises yet. 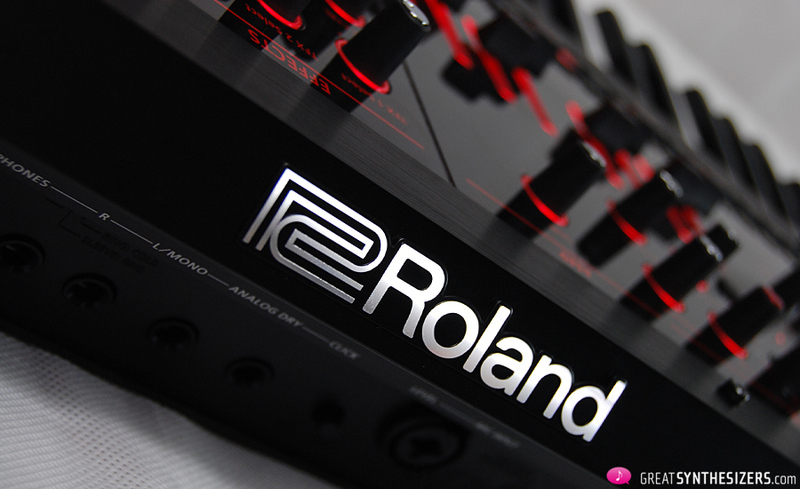 “The first selection is typical Roland, with its powerful resonance and rich, even sweeps; it instantly reminded me of that old favourite, the SH1 filter. 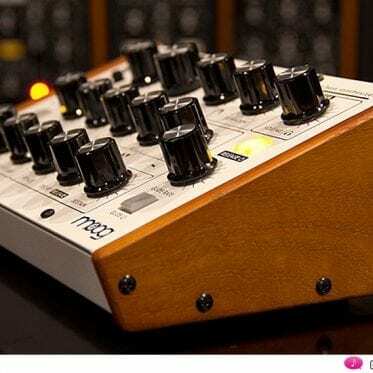 The second is a Moog–flavoured transistor ladder that has (to my taste) a more restrained and musical resonance. Both are 24dB filters and well suited to beefy bass and classic lead roles, but the third is something else entirely. 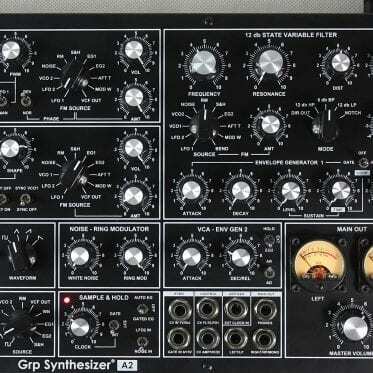 The Parameter Guide describes it as ‘a relatively standard circuit’, but that’s a serious undersell. A 12dB multi-mode design, half the time it sounds broken, but in an entertaining way — like an elderly relative who’s taken to barking at the postman. Introducing resonance gives the impression of modulation by noise and, as you add more, you progress through the sound of frying bacon and into weird, almost bit–reduced territory. Just when you thought the depths of evil, grungy mayhem had been fully plumbed, the drive control adds more. “In its other two modes, the filter delivers high–pass and band–pass responses that, although they can appear fairly normal, soon attain the same madness levels when resonance is applied, turning positively psychotic under the influence of drive. Your review is extremely accurate. The manual is a joke for somebody who is not used to working with Roland synths. I have had my JD-XA for a few days now and I have no clue how to program most of it. The manual is of absolutely no help. I would have thought that your explanation about “unison” in the manual was written in jest but it is absolutely true. Ridiculous. Roland needs to put an instructional video on YouTube IMMEDIATELY!! But the sound……. It is incredible! I wish that there were more presets. Kinda thin in that department, too. By the way, those are some nice programs in your demos. You ought to package them up and market them…..
Are the sounds available to download. I like some especially in your poly 1 demo of the JD-XA. It’s interesting to read your thoughts on the Jupiter-4 and on JD-XA after another. Things you wished the Jupiter-4 / Promars had back then, are available today in the JD-XA. 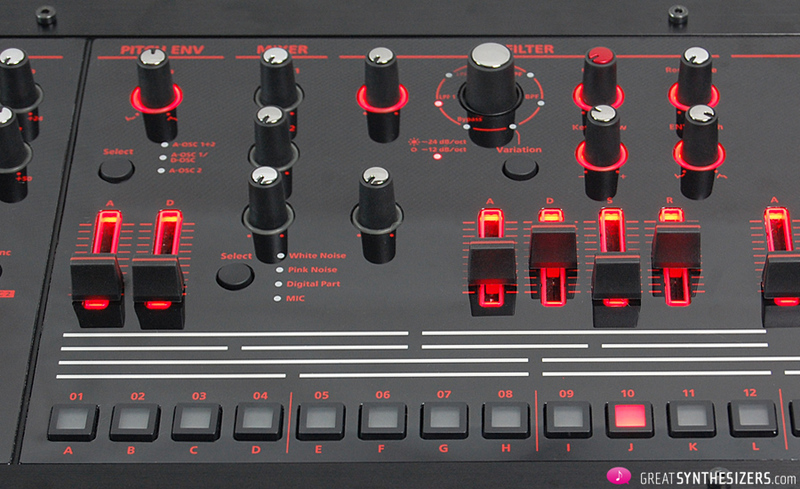 If only Roland updates the sequencer (transposable and step start/end points on the fly), they have a winner. This is going to be the end of my search for another synth, as it seems a lot of synth for the money. I’ve got an excellent hardware sequencer that’s USB class compliant MIDI, meaning JD-XA’s sequencing drawbacks are irrelevant to me. It’s sound and only sound – anything else I can live with. Looks like this goes into territory of several other classic synths, including the Jupiter 8 and even Minimoog. I take it this doesn’t house a full Integra 7, just highlights from it. I hope this leads to a resolve! These are great demos! I’d love to be able to get some of the patches/parts, especially the pads. I also agree with many (if not all) of the points of this review. 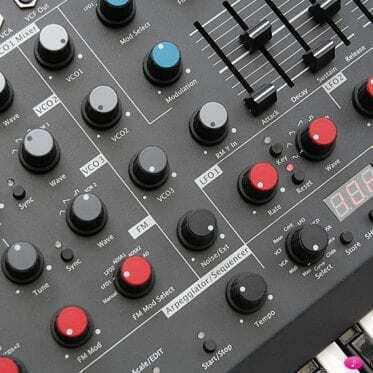 The JD-XA is a return to music-making and synthesis for me, and it is a remarkable, beautiful, confounding instrument – some amazing potential and a rich and complex sound, though with some incomprehensible shortcomings that one figures could have been easily avoided. Roland’s seemed to be within reach of true greatness on this one, but have completely lost the plot on the UX side of the product. 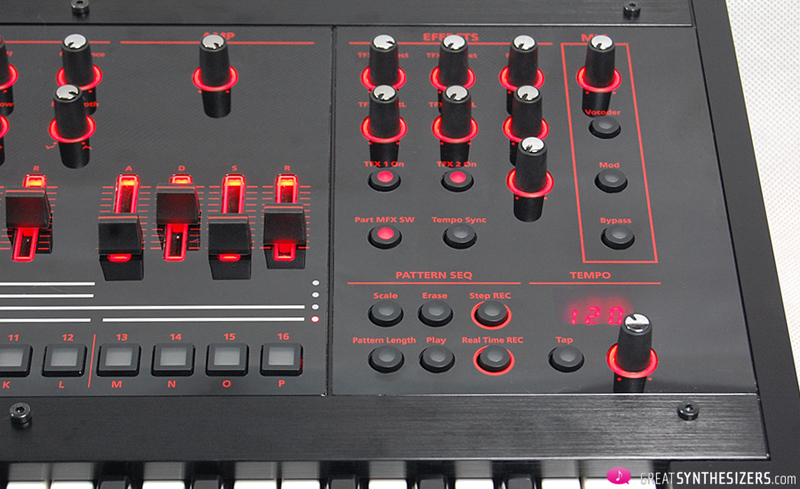 No matter – we have synths to create sound, and this one delivers. Previous PostAVP Synth: the Russians are coming! 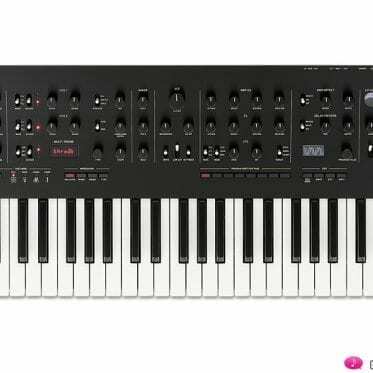 Korg prologue – THE 8-/16-voice pro’s synth? 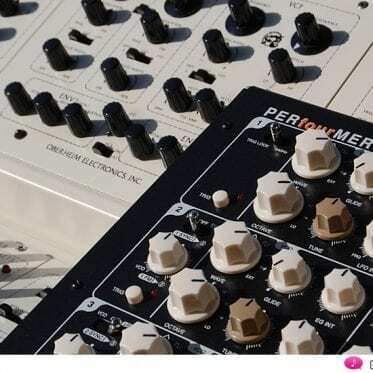 Vermona PERfourMER MKII – the new Four-Voice?